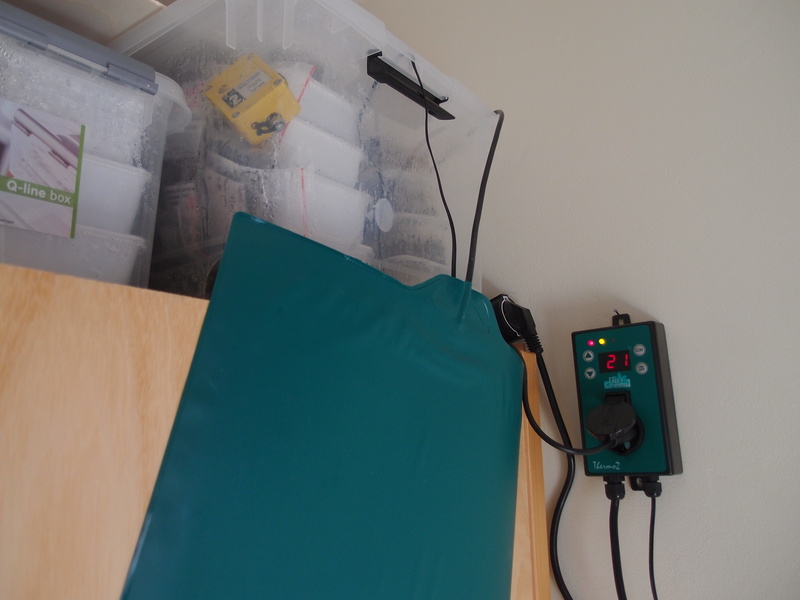 After some serious thinking I decided to try a heating mat and a controller, to store my killifish eggs at a more or less fixed temperature at home. It didn’t work. The fluctuations in temperature right above the mat for example went from 24 to 36 degrees, when I just wanted 22 C… So now I’m back to a system where some tanks with an aquarium heater are standing amidst the boxes with peat. Should work, has done so for years. This entry was posted in Chitchat, Ideas, Incubation by tvdooren. Bookmark the permalink. It should work just fine with a cheap thermostate and a bulb. That’s how I incubate my brazilian annuals and the temperature range that the box gets is not much wider than 1-1,5ºC.